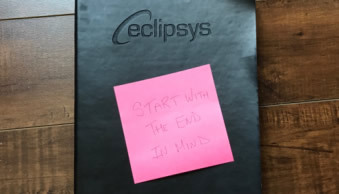 At Eclipsys, we spend a lot of time helping our customers drive more value from their Oracle investments. Customers are eager to use their IT landscape to drive transformational change and innovation in their business with real and tangible outcomes. These are the exciting problems to solve, but where do you start? How can we improve our customer’s experience? How can I optimize our delivery of value to our customers? Where should my teams be spending their time? Where am I spending money that is not adding value? Where do I make investments to facilitate a better customer journey? At Eclipsys, we are building a customer journey map. Identifying all of the places where we engage with our customer throughout our lifecycle with them. This process is critical to defining where you are – but more importantly it allows you to design what the future could be. Once you have that envisioned you can start to implement automation and transformation to improve customer outcomes and deliver efficiencies in your organization. One of our new offerings will enable our customers to drive business value and innovation with chatbots. With Oracle Digital Assistant we are able to create intelligent user experiences to help delight your customers. This will allow you to reach more customers in more regions, more efficiently. We can also help you increase business productivity and time to market by examining ways to add chatbots and artificial intelligence to your internal processes. In our Customer Journey map – automation and efficiencies are key inputs, however real engagement and communication can never be replaced by Chatbots and AI – only augmented. Remember to keep your future state in mind as you build your strategic plan that will continue to delight your customers, build efficiencies and improve your team’s engagement.